Buy the book Man on Ice here! Thrillers like this normally don’t capture me, but I thought Humphrey was able to craft a truly suspenseful and satisfying work. The location is absolutely unforgiving, between the cold and ice that threatens Ozenna every step of the way, along with the human elements that wish to stop him. The environmental dangers were a great addition to this story and taking place in the Bering Strait was a unique enough setting, that most readers may take away some new knowledge of this area of the US. The political intrigue worked to some degree, although the book may have worked a little bit better without those parts since it seemed to slow the action. The maybe unconscious allusion to current events may seem on the nose to some readers, but Russia and the United States’ contentious relationship is nothing new. The characters were pretty well rounded, despite being partial tropes of the genre. Rake and Carrie’s relationship was satisfying to witness and it carried the main core of this story along with Ozenna’s obvious connection to his home. The inclusion of Stephanie Lucas, as the British ambassador, who gives the reader an outside looking in view of the situation in the US. It’s an interesting, but great choice, since it helps bring out some of the international pressure that is felt throughout this sequence of the book. 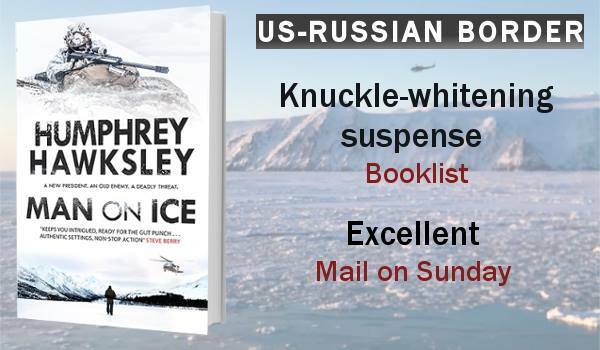 Man on Ice reads like Tom Clancy meets The Bourne Identity. Hawksley shows that he is no stranger to the thriller genre and presents a classic and well-plotted narrative. It’s an edge of your seat read and with being under 250 or so pages, you can read it in roughly an afternoon.